Nigel Finzi was an accomplished violinist who, reflecting his family’s passion for diversity, decided on a total career change in his 30s. He subsequently became the owner of a large Dubai-based construction company. Nigel was the son of composer Gerald Finzi and his artist wife Joy. After Nigel’s birth in 1936, the family moved from Hampstead to the country, eventually settling at Church Farm, the home they had built in the Berkshire village of Ashmansworth. Nigel grew up surrounded by people who shared his parents’ passion for the arts. Ralph Vaughan Williams was a close friend and the composer had been a witness at the Finzis’ wedding. As small boys, Nigel and his elder brother Christopher (Kiffer) spent many happy days with “Uncle Ralph”. Other visitors to Church Farm in those early years included the poets Edmund Blunden and John Betjeman; the designer, painter and engraver Alan Reynolds Stone; composers Sir Arthur Bliss and Howard Ferguson, and guitar virtuoso Julian Bream. While Gerald composed his music, Joy concentrated on her sculpture and drawings, some of which now hang in the National Portrait Gallery. Joy was also the driving force behind the Newbury String Players, the local orchestra the Finzis set up during the war years as an outlet for culture and artistic expression. Gerald conducted, while Joy organised the music and rehearsals, and played violin. Nigel Finzi’s own talent as a violinist was noticed early on. Lessons at home were followed by more specialist tuition at Dunhurst and Bedales, and his potential was further acknowledged when he was given a Stradivarius by a local benefactor. There was also a brief moment when the young Finzi’s talent for acting emerged. He was the boy star of two early John Schlesinger films, The Starfish and The Black Legend, both made while Schlesinger was still at Oxford. However, the violin remained Nigel’s true passion and after leaving school he went on to study at the Guildhall School of Music in 1956. While in London, he shared a flat with the artist Richard Shirley Smith, who was studying at the Slade. The two shared a lifelong friendship and Shirley Smith was a regular visitor to Church Farm, as was another close friend, the composer Jeremy Dale Roberts. It was also during these early years in London that Nigel became a pupil of Jean Gibson, a teacher of posture for performing artists. He became fascinated by this discipline and eventually worked as Gibson’s assistant teacher. The pair helped many well-known figures of the performing arts world maximise their potential, including actor Donald Sutherland and violinist Nigel Kennedy. Nigel Finzi studied violin under Max Rostal, both in London and later in Switzerland. He toured with Yehudi Menuhin, and often returned to play with the Newbury String Players, an orchestra which had a long list of stellar guest soloists, including Jaqueline du Pre – whose sister Hilary married Nigel’s brother Kiffer. Nigel’s first marriage was to Susannah Parsons, and soon after this he made his first major career change – his last professional concert as a violinist was an engagement at Buckingham Palace to mark Prince Charles’ 21st birthday. For his new life, Finzi settled on farming, and he whisked his wife and two young daughters off to Portugal, where he was one of the pioneers of the commercial growing of early season vegetables for the UK market. After an unfortunate business partnership, Finzi changed tack yet again, setting up a maintenance and construction business. Swimming pool construction proved the key to its success, helped by Portugal’s growing expat population, and the business quickly expanded. Then came the revolution, and the county’s economy collapsed. Undeterred, Finzi ran a successful entrepreneurial operation to help wealthy expats save their most valuable possessions and get them over the border as quickly as possible. It was at this point that Finzi decided to move first to Bahrain, then to Dubai. At the time, both were little more than names to most people in the West, but Finzi saw huge potential in the developing region. In 1980, Finzi and his business partner Howard Hilder – with the encouragement of local sponsor Ahmed Saif Belhasa – set up Belhasa Projects LLC. Hilder retired 15 years ago but Finzi continued to build the company into a multi-million dollar corporation. He was working right up to the last day of his life and died peacefully in his sleep. 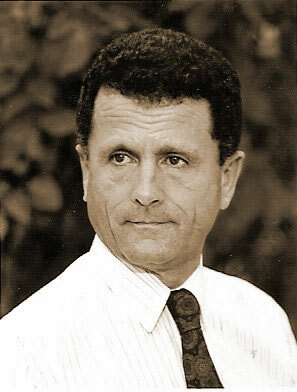 Nigel Finzi is survived by his second wife Josephine and their daughter Joy, and by Lucy and Beadie, his children from his first marriage.